Generates a procedural noise texture twisting into a vortex. The Vortex Speed parameter causes the amount of vortex rotation to automatically animate over time. Background: Optional. Composites the Source and texture over this clip. Frequency Rel X: Default: 1, Range: 0.01 or greater. Octaves: Integer, Default: 6, Range: 1 to 10. Seed: Default: 0.234, Range: 0 or greater. Center: X & Y, Default: screen center. The center of the vortex, in screen coordinates relative to the center of the frame. This parameter can be adjusted using the Center Widget. Vortex Start: Default: 72, Range: any. The amount of vortex rotation, in approximate counter-clockwise degrees at the edge of the frame. Vortex Speed: Default: 30, Range: any. 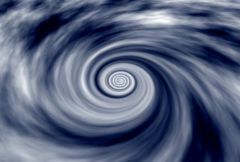 The speed of the vortex rotation, in approximate degrees per second at the edge of the frame. If non-zero, the vortexing is automatically animated at this rate. Angle Offset: Default: 0, Range: any. If non-zero, a rotation is combined with the vortex. Make negative to rotate the inner and outer regions in opposite directions. Scales the 'distance' of the image. Values greater than 1.0 move it farther away and make it smaller. Values less then 1.0 move the image closer and enlarge it. Latitude: Default: 30, Range: -80 to 80. Positive latitude tilts the image down and negative tilts it up. Keep latitude in the range of around -35 to 35 degrees to avoid aliasing towards the horizon. The source brightness is scaled by this value before being combined with the texture. Determines how the texture is combined with the source image. Clouds Only: gives only the clouds texture with no source. Mult: the texture is multiplied by the source. Add: the texture is added to the source. Screen: the texture is blended with the source using a screen operation. Difference: the result is the difference between the texture and source. Overlay: the texture is combined with the source using an overlay function.